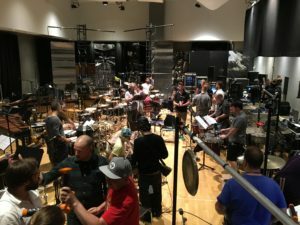 September 6th, 7th and 8th, I participated in an amazing, very-large-scale percussion event called Rythmopolis. A production courageously headed by Fabrice Marandola, Michel G. Barette and the ensemble Sixtrum, Rythmopolis featured over 50 percussionists and artists in an urban, site-specific, multi-media spectacle. Massive sound & lighting rigs, video, several dozen stones, a few dozen flexatones, mobile instrumental contraptions, amplified 3 meter sheets of aluminum… a water fountain or two… not just another day at the office. Several composers contributed new compositions that were crafted specifically for Rythmopolis: Tim Brady, Jean-François Laporte, Pierre Michaud, Jean Piché, Sylvain Pohu, Pierre-Olivier Roy, Michel Smith and the duo Video Phase. The performers included the groups Architect, Torq, EP4, Ensemble Karel, Video Phase, and of course Sixtrum, as well as a four solo artists such as myself, Ziya Tabassian, Shawn Mativetsky & Mélissa Lavergne and a host of younger musicians from McGill University and Université de Montréal. It was an incredible feat of co-ordination and patience to organize this many people (and the truck-loads of equipment) to pull-off an event like this. The September 8th performance of Rythmopolis was recorded by Radio-Canada using an innovative 360-degree camera and surround sound. It’s posted here online for viewing and listening (drag the image to view a different camera angle). There is also a huge gallery of photos here on the Rythmopolis Facebook page. 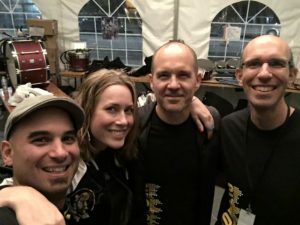 Ziya Tabassian, Mélissa Lavergne, PG and Shawn Mativetsky. This entry was posted in News and tagged Rythmopolis. Bookmark the permalink.